If you control no monsters in your Main Monster Zones: Target 1 Effect Monster on the field; it has its effects negated (until the end of this turn), then if you have 3 or more Spells in your GY, you can take control of that monster until the End Phase. Sky Striker (formally Brandish Maiden) theme this week on CoTD, and first off, we’ve got Sky Striker Mecha – Widow Anchor. Most of the Spell archetype-themed cards revolve around having no monsters in your Mian Monster Zones, so playing them before getting Raye or tokens on the field. Quick-Play for either turn usage, Window Anchor works like Breakthrough Skill without the banish from the grave effect. If you have 3 or more Spell Cards in your grave, Window Anchor becomes Change of Heart in addition to the negation. The bare bones negation is good for the archetype. Stealing the monster is a nice way to give you an extra attacker for the turn. 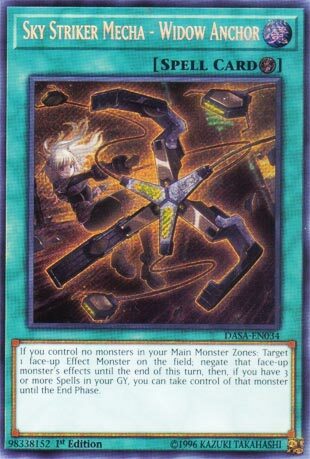 You can’t use the monster to make any of the Sky Striker Link monsters, and making a different link would put your Sky Striker Link monster into the Main Monster Zone and make it tougher to play some of the spells. A Quick-Play Spell effect negation that adds to the Spell Card total in your grave, which helps out Shizuku or Kagari. I’m going to start this week by saying I love this card because it can be used in any deck for free. Sky Striker Mecha – Widow Anchor is a Quickplay Spell that targets a monster on the field for effect negation so long as you control no monsters in your Main Monster Zones. Then if you have 3 or more Spell Cards in your grave, you can take control of the neutered monster until the End Phase. You can use both effects all three times if you have three of them because there are no once per turn conditions. Just make sure you use the first and second for Extra Deck summons. Widow Anchor can also be used defensively during the opponent’s turn to prevent attacks. Keeping 3 Spell Cards in the grave is the balance this card needs to not be absolutely broken. And it’s searchable in its own deck. Yeah, own three of these and try them out everywhere. Score: 4.5/5 Art: 4.5/5 Brandish Maiden is a better name. This week we will be taking a close look at the long awaited Sky Striker cards, staring off with Sky Striker Mecha – Widow Anchor. Widow Anchor is a Quick-Play Spell, so it can be chained to nearly anything. If you control no monsters in your Main Monster Zones, you can target a face-up Effect Monster your opponent controls and negates its effects until the end of this turn, then if you have 3 or more Spells in your GY, you can take control of that monster until the End Phase. Nice disruption for the deck, being able to negate monster effects can be powerful, and being able to take it can extend your Link Plays. Sure you have to have nothing in the Main Monster Zones, but that is what Sky Strikers focus on and it isn’t that bad since you can have a Link Monster, which Sky Strikers have two of, soon to be three. Widow Anchor is a great card for Sky Strikers, if you are running it as an engine then maybe you can tech one of this, but if you are running a Sky Striker deck then I guess two of this should work since it is searchable. Art: 3.5/5 That anchor looks uncomfortable to be in. Sky Striker week! These are some highly anticipated cards, so it’s worth having a week to look at them. SS Mecha-Widow Archor is a Quickplay Magic to open the week. This is a card I like, it’s balanced, and good, but not so good that it’s broken. This card probably honestly wouldn’t be a terrible card simply as Tech or side-deck material either, but it’s great in the theme too. As long as your main Monster Zones are empty, this lets you target and negate the effect(s) of a face-up Monster your opponent controls until the End Phase. Additionally, if you have three or more Magic cards in your Graveyard, you gain control of that Monster, also, until the End Phase. Obviously good for an attack, a Special Summon, even a Tribute, whatever, just use it. Being Quickplay obviously is a gigantic bonus, making this card more powerful. But not overpowering, as referenced at the start.